MSC current in normal rat kidney cells at 5 µM [[J. Gen. Physiol., 115, 583 (2000), Toxicon, 42, 263 (2003)]. Also, this peptide inhibits the atrial fibrillation associated with dilatation at 170 nM (anti-arrhythmic activity)[Physiol. Rev., 81, 685 (2001), Nature, 409, 35 (2001)]. Primary sequence of GsMTx-4 has been clarified recently by cDNA cloning to be a 34- residue peptide possessing a post-translationally modified amide structure at its carboxyl-terminus[Toxicon, 42, 263 (2003)]. Three disulfide linkages in the molecule were connected in the pattern of Cys1-Cys4, Cys2-Cys5, and Cys3-Cys6 (Cys numberings from the amino-terminus) during the determination of its solution structure, indicating that GsMTx-4 is a member of "inhibitor cystine knot" peptides [J. Biol. Chem., 277, 34443 (2002)]. GsMTx-4 should prove to be a useful tool for the study of the biological events initiated by the activation and inactivation of SACs. 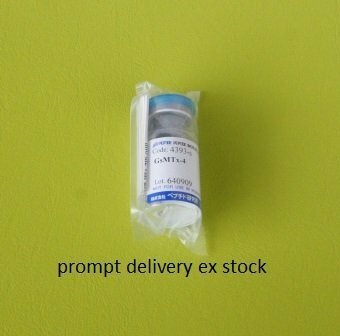 This peptide is distributed through Peptide Institute, Inc. under the license of the Research Foundation of the State University of New York. The use for any purpose other than research is strictly prohibited.